This feature story about the problems stemming from coal dependence includes background on our work to map the impact of mountaintop removal mining. The article, contributed by Megan Jordan, mentions SkyTruth’s partnership with Global Fishing Watch and features a quote from SkyTruth’s President, John Amos. The article covers the research work of McCauley, a partner on Global Fishing Watch, a joint project between Ocean, SkyTruth, and Google, led a study in Science that outlined how this approach could mitigate overfishing, illegal fishing, and other dangers to vulnerable marine species. The article covers the results of a pilot program to tag and track blue sharks to see how close they get to fishing boats whose locations are now mapped worldwide by Global Fishing Watch to detect illegal activity. The blog post featured background on SkyTruth’s work calculating the size of the BP Deepwater Horizon oil spill and the technology powering the Global Fishing Watch platform. This opinion piece on the importance of an independent review on the impacts of fracking in Canada features a satellite image of a remote well site provided by SkyTruth. An update on the lawsuit Taylor Energy brought against the Federal government included SkyTruth’s investigation into the size of the ongoing leak. An article about a new Symposium: Humanities in the 21st Century, included background on John Amos, Founder of SkyTruth and featured speaker at the event. The piece on Indonesia’s changing policies toward resource extraction cites SkyTruth’s theory behind the recent mining policy reversal. The article includes background on the launch and progress of Global Fishing Watch in securing agreements with governments, including Indonesia, Peru, and Kiribati. The article, written by the CEO’s of DigitalGlobe and Planet, outlines the potential of satellite technology. The piece includes background on their partnership with SkyTruth & Global Fishing Watch and the joint effort to address the challenge of illegal fishing. The feature includes details on SkyTruth analyst Bjorn Bergman’s analysis of Global Fishing Watch tracking data to investigate the activity of the Fu Yuan Yu Leng 999, background on the Platform and information on the practice of transshipment from analyst Nate Miller. How Did 6,223 Sharks End Up on Ship With No Fishing Equipment? The article on the results of the investigation into Fu Yuan Yu Leng 999’s journey to Ecuador includes details on SkyTruth analyst Bjorn Bergman’s analysis of Global Fishing Watch tracking data. The blog post on the SkyTruth Spill Tracker details how to enter a pollution report, includes background on SkyTruth Alerts, and background on our mission. Kuwait says an oil spill has been spotted near the site of a similar spill off its southern coast in August. The wire story references SkyTruth’s work to estimate the size of the prior spill (estimated at 34,000 gallons). The feature includes background on SkyTruth and an upcoming presentation by John Amos at National Conservation Training Center symposium. The article includes background on SkyTruth’s recent contributions to a research report entitled “In Everyone’s Backyard: Assessing Proximity of Fracking to Communities At At-Risk in West Virginia’s Marcellus Shale”. The blog includes information on the release of the SkyTruth Spill Tracker following Hurricanes Harvey and Irma. A citizen pollution reporting tool, the tracker collects pollution reports in one place and makes the information available to the public and relevant authorities. 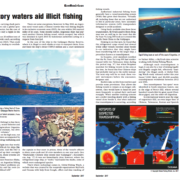 The opinion editorial focuses on the power of the Global Fishing Watch platform as a transparency tool. Savitz encourages governments to join Indonesia and Peru in making more vessel data available to the public. The article focuses on transshipment and references the transparency work of Global Fishing Watch. The piece references SkyTruth’s satellite imagery analysis and includes imagery of the Arkema plant, coverage also appears in Texas Monthly and Houston Public Media. The article includes information on the environmental contamination from the storm from SkyTruth Alerts. The post references Bjorn Bergman’s work to identify the four Fu Yuan Yu fishing boats recently fined for transporting illegal sharks. The article references SkyTruth’s work with Google and Oceana to launch Global Fishing Watch to allow real-time tracking of vessels to combat IUU fishing and includes details on Bjorn Bergman’s work to uncover Chinese vessels falsifying location data. The article includes information on SkyTruth’s analysis of the size of the spill and possible causes, referencing a SkyTruth blog post on the subject. International wire article includes SkyTruth’s estimate of the size of the spill, coverage also appears at ABC News, in the San Francisco Chronicle, The Washington Post, US News & World Report, Kuwait Times, New Zealand Herald, and other publications worldwide. The article on seafood fraud references findings from the Global Fishing Watch transshipment report. Coverage on the report released by SkyTruth in collaboration with Downstream Strategies and San Francisco State University, “In Everyone’s Backyard: Assessing Proximity of Fracking to Communities At-Risk in West Virginia’s Marcellus Shale,” says that more than 7,000 homes were found to be located less than one-half mile from well pads in 2014. Featuring an image by SkyTruth, the article focuses on the link between fracking and earthquakes. The article covers the new science tracking transhipping, the high-seas transfer of seafood catches between ships and includes details on SkyTruth’s role launching Global Fishing Watch. Taylor Energy Co. negotiating settlement to recover millions of dollars set aside to stop an oil leak in the Gulf, despite failing to close it. John Amos is mentioned saying SkyTruth analysis shows that the leak isn’t slowing down. Analysis of NRC data by SkyTruth is used to estimate the quantity of unreported oil leaked into the Gulf of Mexico from unreported spills every day. SkyTruth provides imagery to a community that suspects wastewater injection is causing small earthquakes in Colorado. Featuring SkyTruth President John Amos. An oil spill in Gravesend Bay, New York, prompts John Amos to comment on how players in the oil industry consistently under report the frequency and severity of spills. Pam Kasey talks to John Amos to discuss SkyTruth’s mission and how from a small office in Shepherdstown we can have a real world impact. Global Fishing Watch’s Research Program Director David Kroodsma talks to Smithsonian Magazine about the prevalence of illegal fishing in the world’s oceans, and how activities such as transhipping obscure supply chains and make it difficult to regulate a shared resource like the ocean. Global Fishing Watch and SkyTruth are mentioned in this article about the global footprint of transhipments. Between 2012 to 2016 researchers identified 5,000 cases of potential transhipment between reefers and smaller fishing vessels. There were also 86,000 cases of two reefers meeting at sea, which could possibly indicate smuggling. 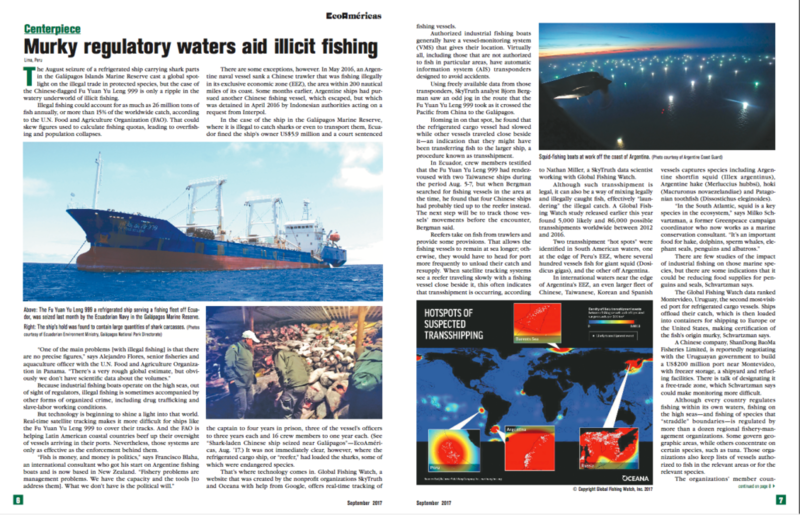 This article in Spanish mentions SkyTruth and Global Fishing Watch while discussing the transhipping hot spots of the world, and how mixing authorized and unauthorized catch makes it difficult for fisheries managers to accurately monitor the world’s fish populations. The people at Global Fishing Watch provided this story to Science News coinciding with the release of their report, A Global View of Transhipment: Preliminary Findings. Using tools developed by SkyTruth and Global Fishing Watch, fisheries managers can now identify and monitor transshipment anywhere in the world. In this article in ars TECHNICA, the author discusses how Global Fishing Watch uses AIS data to catch refrigerated “reefer” vessels in the act of rendezvousing with illegal dark fishing vessels. Featuring mentions of our very own John Amos and Bjorn Bergman. SkyTruth’s founder, John Amos, talks to The Journal about why he founded SkyTruth and how he wants to make environmental imagery more accessible to the public at Shepherd University’s Presidential Lecture Series. News Review, Peter DykstraSkyTruth’s pioneering work using satellite monitoring to aid in environmental law enforcement is listed as one of many positive environmental legacies of the Obama era. Think Progress, Aviva ShenSkyTruth’s estimate of an oil spill on the Chandeleur Sound is used by activists in Louisiana to fight the construction of the Bayou Bridge Pipeline. National Geographic, Ayana Elizabeth JohnsonNat Geo lists the launch of Global Fishing Watch as one of the greatest achievements in ocean conservation in 2016.